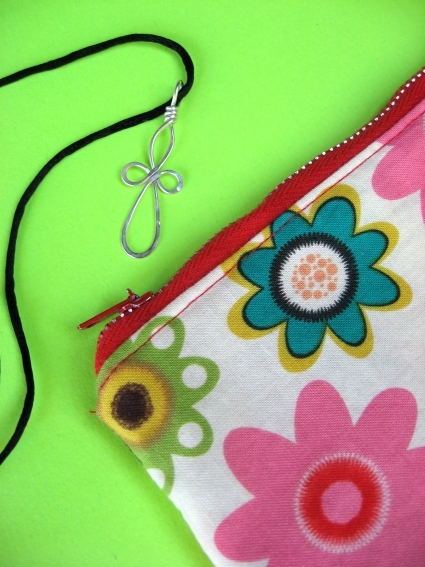 Here is a quick little tutorial for making a zippered pouch with a lining. It isn’t that hard and I always feel like I have really accomplished something when I am finished —and they make great gifts! I was a mentor for one of the youth at our church. At Confirmation they are each given a different bible verse, special to them, to mark the occasion. I wanted to give my Confirmand (the sweetest girl) a gift with her bible verse so I decided to make a little zippered pouch with the bible verse sewn inside. I printed the verse onto printable fabric (purchased on a roll from Joann’s) and sewed onto the lining before stitching the pouch together. I also covered the lining pieces and the piece with the scripture with iron on vinyl before I sewed. I wanted her to be able to use it for make-up etc. Another bonus was that it doubled as the “gift bag” for this beautiful handmade cross . To make a pouch begin with 4 pieces of fabric (two of outer fabric, two of lining fabric) all cut the same length as the full length of your zipper and any width you choose. Make a zipper sandwich. Place 1 piece of lining fabric face up, then the zipper and then the outer fabric right side facing down. Line up the three edges. With a zipper foot sew across the top between the edge of your zipper sandwich and the zipper teeth (closer to the zipper feet). When finished and you pull fabric back it will look like this. Repeat this for the other side(edge) of the zipper. Oops the fabric should go all the way to the end of the zipper. When both sides are completed it will look like this. Hopefully you will have pinned before sewing and all of your edges will match up beautifully (unlike mine). You can top stitch along the zipper now, if you like. 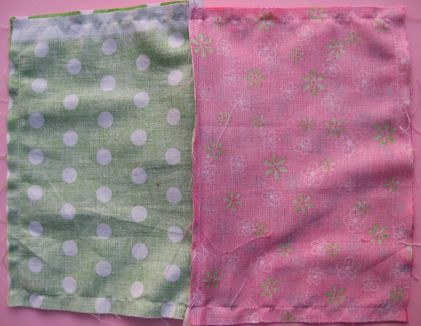 Bring both pieces of lining to one side and both pieces of your outer fabric to the other side. Un-zip zipper at least halfway so you can turn it once it is stitched. If you forget to un-zip the zipper you won’t be able to turn your pouch right side out. The zipper teeth should be pinned toward the lining side. I lay the zipper ends on top of each other with teeth facing the lining side and pin. Sew all the way around 1/4 inch from the edge. Make sure you sew on the outside of the metal parts on each end of the zipper, this will be easy to do if you cut your fabric the total length of the zipper. Leave a two inch opening at the bottom of the lining side. Clip corners. Turn right side out. Stitch opening closed by machine or slip stitch by hand. Push lining inside and you are finished! These would make cute Valentine’s Day gifts with a little love note printed inside! Thanks for your simple tutorial - easy to follow and clear pictures. Made a cute bag for my daughter at college - zipper pouch are always handy. Your post makes this so easy to make! Thanks!! I can't believe how simple this process is. The pouch seems so upscale. Thank you very much for the tutorial, I can't wait to make mine! Using this tutorial to make gift bags for Chrismas! so easy and pretty! So easy and so beautiful. We are doing DIY presents this year and I know two little girls who would love this. What a surprise to find my confirmation verse on your zipper pouch tutorial! Please let the young lady know that I will be praying for her whenever I think of this verse. Thank you for the quick and simple pouch tutorial! Thanks so much! My daughter wanted on of these for wet diapers and you made me feel as though I could actually do it! Do you have a PDF version of this pouch so that I may print it out and learn as I go please? Gena, so happy you liked it! I made your lined pencil pouches two years ago....maybe 25 of them. i'm back now to make more. excellent tutorial......too bad i didn't see a print link. Thank you for these great instructions! I had never ever sewed in a zipper, but I made a lined, zipped cosmetic bag! I took my son's best friends daughter school shopping for uniforms and school supplies, (her dad is not a shopper!). She picked out a pencil bag, it was cute but wasn't going to last very long so made her a sturdier one using your tutorial (so easy and quick!) with her name embroidered on it and Swarovski hot crystals in the middle of some of the flowers. Have not given it to her yet, but know she will love it. Thanks for the brilliant idea! Thank you for the tutorial.do you do tutorials for sewing travelling bags? I love the verse added to the bag. I must try that for Christmas. Thanks for sharing great instructions and clear pictures. Keep it continue! Thank you so much for this easy to follow tutorial. Great instructions and clear pictures. Just made a cute little zipper pouch with some emoji fabric I found, for a last minute Christmas gift. Thanks for the helpful info. I used it for a one piece bag with lining but it still worked well. The instructions the original design came with were mighty odd so yours were great. Very straightforward. Thank you so much for the pattern for a lined zippered pouch. I had made a tote bag as a present and wanted to attach a matching purse. Your instructions made it so easy! Thanks so much for making this, I found it really easy to follow. Do you have any tips for completing this tutorial without a zipper foot? I've managed okay so far but the result are a bit wonky. Thanks. Amy, it is a bit hard to do it without that because the regular foot keeps you from getting close to the zipper. You probably could find a zipper foot for your machine. Hi! Thanks for the tutorial. When making the zipper sandwich should my zipper be right side up or down? This is awesome! So easy to follow and so proud of my work! My first zipper was an uber success! Thank you. I always skipped a sewing assignment if there was a zipper included. Thought if would be too complicated...Thank you so much. you have unlocked a new area for me. Ahhh Maureen that makes my day! You make the best tutorials! Thank you so much!! Ahhh thanks Elissa, you made my day! I made one and it was my first attempt at a zipper. I've since made two more for my sister-in-law. I'm no longer afraid of zippers! Thank you for posting. After you make the first one and get it down, you can easily make them from start to finish in less than 30 mins. So happy it worked for you Rosha! Wow, it's like a pillow or a bag, I can use your way to make a pillow for my newborn baby. Thank you very much! Thanks Cindy, so glad you liked it! I've been looking for a tutorial on how to make a lined zipper pouch, glad I stumbled upon your blog! Thank you so much. My first successful zip! Great, clear, tutorial! Thank you for including the pictures that clarify. Very well done, young lady, thank you! I love handmade gifts.. This is very cute. This a lot of help,was having trouble with the zipper. Esta buena la explicación porque se entiende. si me gustaría saber como cortar los bolso de hacer mercado. también la explicación para cortar pijamas para damas. Thanks for posting this tutorial! I've come back to it over the years - made cupcake/pink satin ones for my bridemaids when I got married and last night I made an adorable monster pouch with my 2-year-old. Thank you for these great instructions. This is a really fun project! I'm hooked! I'm going to give some to my daughter made out of canvas w markers so that she can paint her own inages on it. Thank you for taking the time to show us this project. I plan to make many of these. Love your zipper pouches! But, I have made 4 and they all turn out with the lining on the outside and the fun fabric on the inside. What am I doing wrong? Thanks for any help. You're placing your zip the wrong way round when placing down on to the lining fabric (when making the sandwich) Because I just did it too! It's because it says put the zipper and the outer fabric face down. It's not meaning the zipper as it should be facing up. I am reading about this in Okinawa right now. I can't wait to go home to try this project next week. I've never done a zipper bag, and I think your tutorial appears to be quite easy. Thank you. 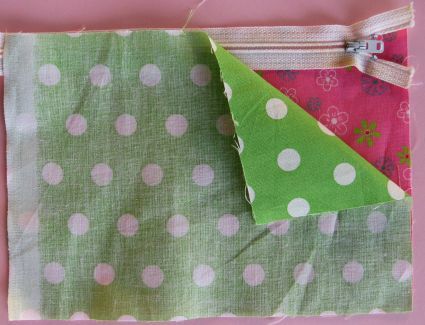 I am learning sewing, so I will try to make this zipper pouch for my own. This is am awesome zip tutorial, but more than that, it is a reminder of a command from the living God that I consider quite important. "Be not afraid" is more than just words of comfort, it is a warning within the command. Rollercoasters, scary movies, things that cause a fright can cause permanent medical illnesses. God is good ! He does provide us with written instructions , we just need to pay attention. I just made my very first bag from this tutorial...made it a diaper bag and added straps. It was also my very first time sewing a zipper on to a bag as well..I must say this is an awesome tutorial! My first creation was a braided towel rug for my bathroom and it turned out awesome and so did my first diaper bag! Thank u! I made my first pouch tonight. It turned out great. I added an inside pocket. Thank you for the well written tutorial. I'd loved to send you pictures. Please Rachel, I would love to see your pouch! I’ve been looking online on how to make a zippered pouch all day! You win! Your Instructions are the best! Thank you sew much! Wonderful, easy to follow tutorial. Is quick, direct, gets to the point. Thanks so much. I love your tutorial! It is an excellent description and very easy to follow! Thank you very much! I already used it twice and I linked you up to my post. I hope you agree. The post with the link to your blog is going online tomorrow (GMT)! Thank you for posting this. I have always wanted to make one of these. It looks terribly difficult but I will try anyway. You are officially a genius!! I had started making a laptop sleeve using another pattern but got stuck...was looking for something simpler and came across your tutorial. Did I mention you are a genius? Finished making the sleeve and its beautiful. Thanks so much!This tutorial was SO much help. I love my zippered pouch.I am going o use it for a First-Aid Kit!!! iff so after that you will without doubt get fastidious know-how. carrier that is insuring the car would pay the difference. Gracias por compartir una manera muy fácil de hacer bolsas con ziper y forro. I first found this tutorial in 2010 and have always come back a few times since then whenever I need a refresher. THANK YOU FOR POSTING THIS! are going to call and follow up on those interests. review you ordered in real life. With an outsourcing partner, you can choose the hours you work, though some companies might require a set schedule from you. we ddo engage with, first of additional driver insurance rules all, the annuity that has no liquidity. liens, and treat them as a risky investment. Thanks so much for this clear tutorial on a zippered pouch. This is an awesome tutorial. Thanks for taking the time to do it. Thanks for this tutorial - I am a beginner (I have only really hemmed stuff) & this was so easy to follow! The salesperson at the sewing shop said she never does zips as they are too hard, not with these instructions! Hi, this is a wonderful tutorial!! I was just wondering, what fabrics would you recommend to make this? Lining and the actual wallet? my own content on my blog. 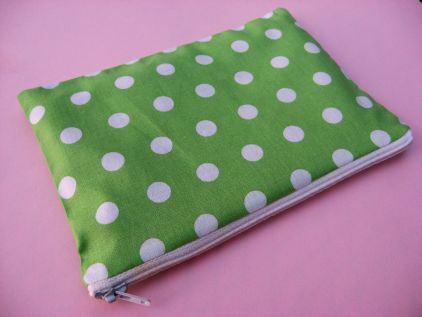 I've been looking online on how to make a zippered pouch all day! You win! Your Instructions are the best! Thank you sew much! Thank you so much for this tutorial! I tried 2 others and this one is by far the best. The finish is lovely and neat, and as I'm making these for underprivileged girls, I feel, like us, they deserve to receive a really good quality, well-finished article. Thank you again! This is the simplest tutorial I have seen so far for a zipped pouch. Thank you for sharing it. It looks easy enough for me to have a go, some tutorials still look scary and difficult for beginners. Excellent tutorial. I really like your method it is much simpler than mine and nicely finished. If you make them big enough you could at grommets to put in a school binder for a pencil bag. I've made some for my kids in the past but I must say the next time I am going to use your method. Thanks so much for sharing. I just bought a sewing machine and this was my first project. I love it, thank you! Thank you for a very clear and concise tutorial with great pics. Very simple to do--I like that! Thanks. Pinned this in Pinterest so that I can go through the tutorial again when I make this. I am new to sewing and never thought I could sew a zipper... thank you for the details they were so very helpful! I think your blog is super*duper too! I have used this tutorial many times and my make-up bag just broke so I decided to come back here and make one for myself! Thank you for a clear and easy tutorial! Thank you for this tutorial. I started following another tutorial for a bag similar to this one, and went through 3 tutorials before I found out what to do with that zipper while sewing around the liner and outside fabrics!!! Thanks for adding that step in there! I made my first zip bag today- and sewed my first zipper EVER! So proud! Thank you! Thanks so much! Just made my first pouch! I'm so glad I finally found this! I thought I could figure it out myself but after 3 bags with mismatched sides, seams showing and zippers locked inside, I had given up. this is so simple now. Why didn't I figure it out! Thanks for the help. Great tutorial, Cindy! Thanks for sharing! You said it would be fast and it really was! I was actually surprised HOW fast. I've newer sewed with a zipper before since I'm a beginner. And this was the first of many to come. Thank you so much for a great tutorial! Thank you so much for this wonderful tutorial. Ive been staring at my zips n fabric for an hour trying to work out how to get it all together before finding this. You have made it so easy. This is seriously the cutest thing ever! I just made one for a gift and I want to keep it for myself :) I guess I will have to make another one or ten. Thanks for the great tutorial!! Thank you so much! It is so easy to follow your directions, and my clutch purse is very nice. Zips were a daunting prospect before I came across your post. Thanks heaps! Hi, there! I did it! In an afternoon and it was simply wonderful to have this tutorial to guide me. I felt as though I am delivering a baby as I pulled it inside out and watched my "baby" [of sorts!] come out! I am a doctor by the way and it has been a looooooooooooong time since I came back to this hobby of mine-sewing, and it was scary, exciting, nerve-wracking, absorbing, thrilling [when it was done!] and absolutely satisfying! Thanks so much for the tute. I began with a bag in mind, found this tute to make a matching pouch and ended up making this pouch first, I was so excited! Ohhh! It was fun! And I did experience some post-partum tremors! Hahahaha, just like I did after delivering babies as a doc...I'd love to post the picture of my cute pouch but not sure how to do that? Great tutorial!! These look so difficult. But after making a couple I don't even look at the tute anymore. I am making bunches of these from scraps. Don't know what I'll do will all of these. Maybe I can find a charity that can use them. Thanks for such an easy to follow tutorial. I put this together with your reversible tote as a birthday gift for my sister. Once again I added fusible facing, but only put on the outside fabric. Super easy. Thanks for the instructions. Thank you so much for the great tutorial! I have always wondered how this was done, and now I just finished my first zippy bag to match my purse! What a great idea that you had for your bible group too...I love that verse. I thank you from the bottom of my heart. I have been sewing for myself and for others for 45 years and never had learned a good technique for this. Simple and awesome! how do you add a shoulder strap? PERFECT! Exactly what I was looking for to make a little change purse to match a new purse I've sewn. Thanks for an easy to follow tutorial! Wow! If I'd known it was this easy I would have made a gazillion by now! I've been lazy and just done them envelope style with a little velcro button. Thanks for the tute. Hi, thank you for your tutorial, it's really helpful. But i was wondering if you have an instruction on how to make a clutch bag that doesn't show the zipper? I am a brand new at sewing, and after reading this article I bought some cute fabric and made my first little bag! It turned out great, even though I'm so inexperienced. I can't wait to make more. The next one, which I'm starting now, is going to be a little pouch for my e-reader. Thank you so much for this great article! Well, Jen, I'm having exactly the same problem as you. And my lining fabric ended up on the outside. Gotta head on back to the thrift store for some 10cent zippers and will practice on some cheap fabric til I get it right. If I figure out what we're doing wrong I'll post another comment! Maybe someone with more zipper experience can help us out! Thanks for a wonderfully simple to follow tutorial! I made a handbag for my best friends birthday, and had 2 scraps of fabric left over (each a little larger than a credit card), spare lining, and the desire to make a little zippered pouch to match the handbag...and no idea how to get started - zips are daunting to the inexperienced!! 30 minutes after finding your site I had a wonderful little pouch which completely matches the bag, and is large enough to fit a credit card and some cash. I also added a little wrist strap sewn between the outer and lining, so she can carry it more easily. It took me longer to work out how to put the zip foot on the sewing machine than to make the pouch! I've made seven so far and given away six. I'm am addicted to making these because it's fun using scrap material. Next I'm sewing a few for my daughter-in- law's baby shower. Thanks for the tutorial for this newbie to sewing! Thank so much for creating this tutorial! I just made a lined wetbag using your instructions and it turned out pretty darn good for a beginner sewer! I'm very pleased with the results. Next up, cloth napkins! Thanks again! Featuring it on Blooming on Bainbridge tomorrow! Linking up with Kim of course! Cause I GOT MY CRAFT ON! Your tutorial is wonderful. Jusy what I have been looking for, I will be trying out your technique. Thanks for sharing your talents. WHY do I not have your blog button on Blooming on Bainbridge! I just made a cover for a new kindle that is so much lighter than the ones they sell. I put a hard liner between the lining and the fabric to protect it. Thanks for your clear, helpful directions. This is a great tutorial! The pictures are so helpful. And the pouch is adorable! Love love love these! I actually managed to make one myself. Some how, some way, it came out good!! LOVE these bags, this was my second EVER sewing project, having the visuals to look over really made it easy to follow. Of course the first one I made took over two hours... since then I am down to about 45 minutes a bag... can't thank you enough!!! WELL DONE!!!! LINDA! Whoooppeeee! Thanks so much for this awesome tutorial.... I see some little cosmetic bags in my future. thanks for the inspiration...linked you to my site as I followed your instructions. Again, you've outdone yourself with an incredible tutorial! I love it! I have made two in the last two weeks! Thanks so much for sharing your time and talents! I knew i could find a tutorial somewhere for a lined zipper pouch. You make this look so easy! I'm going to give it a go this weekend. very clear instrux. thanks so much. made a pouch earlier today and knew there had to be a simpler way. i see there is. i'm going to use your instrux later today! YAY! thanks. Thank you so much. This really helped me I was trying to do a purse from Quilts and more, but they didn't explain as simple as you did. This really helped me. Great tutorial! Just wanted to let you know I finished up a couple and posted about it, linking back to you of course! I LOVED this tutorial. SUPER easy~THANKS for sharing! this is amazing. i made five already! and each has come out perfect! Would it be okay and look okay if I used a 12" zipper? I googled and found your wonderful blog because I was looking for different ways to insert a zipper. BUT this post was a gift. I used the verse to send to a loved one who truly needed to hear that. Thank you! This was so easy to make. I posted it on my blog today. Your tutorials are great. I love, love, love this pattern. 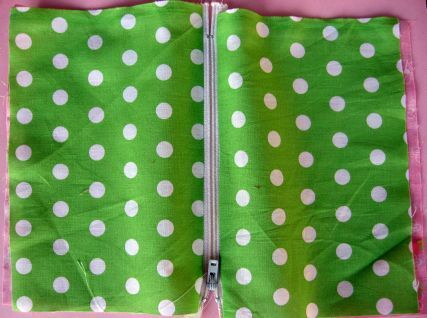 Your zippered pouch is adorable, and easy to follow instructions made this easy to make. I added a front ID pocket to the front with a vinyl window and a key rey ring. Perfect! I have given a few away and didnt take a picture. I will send you a picture soon. Thank you. thank you so much! i was terrified of zippers, but you made it so simple! now i'm a zipper-pouch-making-machine... just in time for christmas gifts. Interesting post. This is a very creative pouch tutorial. The patterns you used are great. Thank you for this tutorial. Thank you for a great tutorial - I am a fairly newbie sewer, and found the instructions clear - managed to get through the whole thing without a single hiccup! The only instruction i found confusing was "The zipper teeth should be pinned toward the lining side. I lay the zipper ends on top of each other with teeth facing the lining side and pin." - after having made it i still don't quite understand this bit! By zipper teeth do you mean the fabric-y part of the zipper? This is adorable and a great tutorial! Whoever designed your website did a fantastic job. It's ADORABLE! I love the little girl clicking her heels!!! Hi! Your tutorial is great and looks easy to follow. I'd want it to make my version of pouch based on you tutorial and share it on my blog in http://crochetandcraft.blogspot.com with credit to you. I hosted a crafting afternoon at the weekend and we used your tutorial to make our own make up bags. It was very easy to follow, thanks very much! Pictures etc on my blog: http://tillyandthebuttons.blogspot.com/2010/08/crumpets-and-crafting.html. Thanks sooo much for this tutorial!! 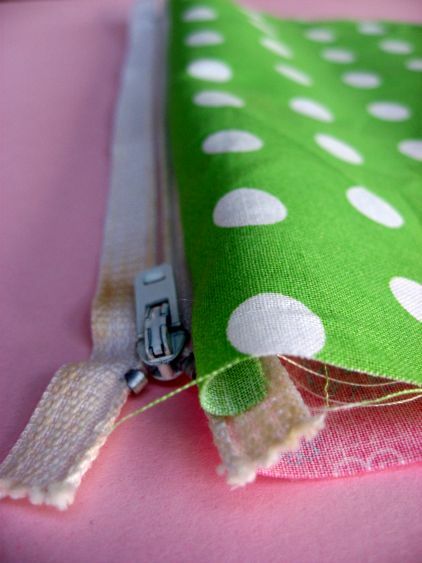 you're awesome.. one can take this idea and apply to any pouch they want to sew a zipper onto!! I did exactly that and made zippered shoe bags for my in-laws when they were travelling for the first time to UK as a part of some travel accessories I made for them!! 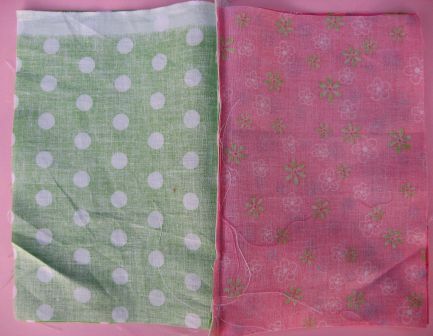 I just made two wet bags, using PUL lining, using your tutorial and another. Yours is much better! Thank you! Awesome...thank you. I have made bags, but my daughter would like a zipper bag for her ballet stuff , and I have so much fabric ...this is going to be fun. again thank you ! We have another winner for me. And let me just say, the Bible verse idea was what did it for me. Not to mention the cutest coloring, once again. I have never done zippers yet, but this tutorial has convinced me to try. Thanks for posting. Oh Cindy I love every thing you write in your blog.. I made this purse for a friend's wife he was so happy see it.. Oh! and all the compliments that I got from my yahoo group that I posted a photo of the purse I made.. Cindy you're just too good for writing out the instructions so clear and concise!! and for investing this method that is SOOO simple.. I am a member of sew-what's new and when I posted the photo in there it was actually featured on the site!!! Thanks soooo much Cindy! Hugs!! Thanks for this tutorial! I usually can't or won't follow instructions, but your method really does work! Thanks so much for this great tutorial ! My first one came out great, and used up some scrap fabric I had on the cutting table, along with a zipper recycled from some khakis our son wrecked. What a frugal and fun way to use those up ! I almost messed up though, because I thought the zipper went in face-down (wrong side up) in the first step. Trust a communications major to misunderstand your very clear directions ! Your great photos corrected my error before I made it, so thanks for those, too. Well, I'm off to try this with the embroidery sewing machine and some clear vinyl on one side. Wish me luck ! I cannot thank you enough for this. I love this blog and everything you put on it! 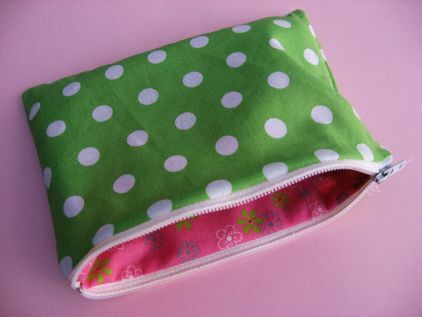 Because of this tutorial I am the proud owner of a zippered pouch which I sewed myself. I've only been sewing for two weeks and you made it easy! Thank you again! Easy easy, just made my first cosmetics bag. Thank you for the tutorial. I just used your tutorial to make a zipper pouch for a friend. I adhered fusible interfacing to each piece of fabric. It was a quick project that turned out perfect. Thank you for the directions and photos! Thank you VERY much for this tutorial. I am adding a zippered lining to a handbag and it's not in the pattern...this saved me so much time! What a great little pouch...I just made two tonight. Thanks so much. What a great idea! I have been looking for a cute idea for my nieces for Christmas and this looks perfect. I haven't used the printable material before, but with some riff-raff around the edges it should be perfect. Great tutorial! Looking for YKK zippers for your pouch? Check our website www.kandcsupplies.etsy.com. Thanks for the tute! I had to bring my w-i-p to the pc and compare what I was doing with your fab photos twice. I managed to make the pouch just in time for a birthday party gift. I personalized the bag using t-shirt transfers (ink jet iron on's). I first printed the photo and lettering. Then I ironed it to an old t-shirt and cut it out. Then, I appliqued it to the outer fabric and constructed the bag. I decorated the front with matching buttons and made a matching zipper pull. It was a hit! I think I'll make more of them real soon. Thanks a bunch! I just wanted to comment on the instructions. So easy to read and understand along with the pictures, they are close enough so you can see what your sewing and where you need to be..Thanks for the super easy instuctions...Easy Christmas gifts this year.. Awesome! Thanks! This was super fun and easy! I wanted to thank you for your tutorial. I just made both of my girls their school supply pouches for school with your instructions. It was quick and easy and they turned out great. Hi there. I have been sewing for years (uh, have a successful handbag and design business), and never braved a zipper. It's sad, but true. Just used your tutorial, and can't believe I hadn't done it before. Thanks so much! This is adorable and exactly what I was looking for. Thank you for this easy to read tutorial. I'll be trying it out soon, aiming to duplicate a cute coin bag I got at a thrift store. I just couldn't visualize how to do the turning right side out, but you helped me out. 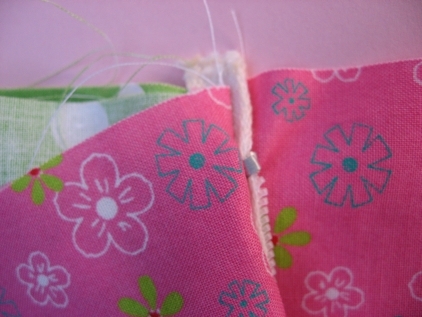 Also, saying to line up the fabric edges with the zipper ends is very useful. Lovely site you have here. Thank you! I have two purses half done, but I keep putting them on the back burner simply because I haven't been satisfied with how my zippers come out. I'm heading to my sewing room right now to see if I can finally finish these bags. I really need a new purse! I love your website! 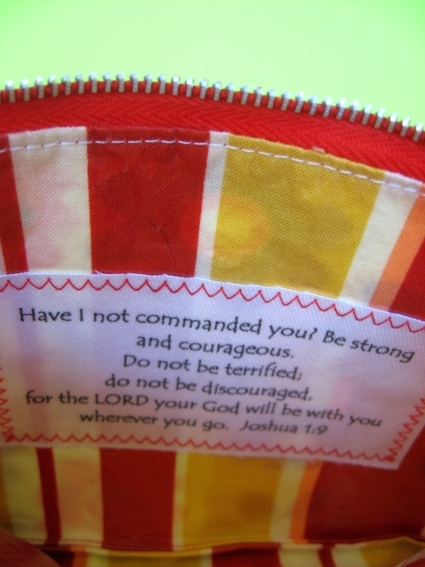 It was such a blessing to see your Bible Verse inside the zippered pouch...Plus the how-to make a zippered pouch! You made it look easy and I can't wait to try it! Thank you sew much for sharing and God Bless!! Now, that's a dandy tutorial....AND a great idea. this was the best tutorial ever! very clear, simple step by step directions with large easy to see pictures. thank you so much! Oh my goodness! These are adorable and look so simple to make. I am also intimidated by zippers, but I can't wait to try this one. The iron-on vinyl is a great idea. Thanks for the inspiration. Thank goodness for you! I was trying to make a pouch something like this for my friend and I just couldn't figure out how to get the zipper on the right way. Thank you for the wonderful step-by-step directions, they were super helpful! Thanks for the tute! You are very good at the whole step by step explanation. But I had one question. I've been wanting to make my daughters a little purse to hold little items in, and I think this would be perfect, except with a strap. I think I have an idea of how to do that, but I don't necessarily know if it will work. Do you think maybe you could explain how I might do this? P.S. What a thoughtful gift, and what a lucky girl! Thank you! This has been on my list once I unpacked my machine. Well, the sewing room is ready, but I haven't gotten busy. I'm making this during naps tomorrow. Thanks! Great tutorial! Made my first zippered pouch last night and it turned out perfect! Thank you! You have taken away my hatred of zippers!!! I love the idea of putting a little quote or verse inside! Maybe this little tutorial will help me conquer my fear of the zipper. I love it! I will have to it a try. This is really great. I have been making them by the Angry Chicken method, and then a short cut to do the lining and outside at once, but it left raw edges inside my lining. This has me ALL inspired to make some again. Thanks. Great tutorial, I will definitely try that. Darn! I messed up my blog name! Should be fixed now! Sorry! Oh that's too cute! I've never sewed a zipper into anything.... Will definately have to try this one out! I need to get some iron on vinyl!! Thank you for this tutorial!! I'm kind of a beginner and linings had always puzzled me, but no more!! I love your step by step with the pictures. So helpful. BTW- I love the crayon roll tut. I made one for my crochet hooks and it is perfect. Thanks again! I am going to link to this. I want to remember this. I love it! Wow this looks so easy that even I could do it.. and I am dead scared of zippers!! Thanks so much! Fabulous! thank you! Now to just remember it is here. Oh how fun! And I just bought the cutest fabric-perfect timing! I'll be linking. That is so dang cute, I'll have to try that one! I just love polka dots. This is getting added to my "Christmas/Birthday" Gift list. I love to make tons of different things and have them ready for any occasion! This will be perfect! Thank you for all of your ideas, they are fantastic!! You have taken away my zipper fear. I think I must attempt it now! I have about a zillion zippers here that I got from my husband's grandmother and am too intimidated to try to use them, but I think this might help me try! What a fantastic gift! I wish I'd done something similar for my youth group members. What a sweet and thoughtful gift. You're my mentor also - I'm so excited to try this! Thanks so much for this. It seems like I should have been able to come up with it myself, but sometimes it takes another person to spur my creativity. Thanks! I really love your tutorials! Thanks so much. I'm not great at sewing, but you make it so easy to understand. Please keep them coming! 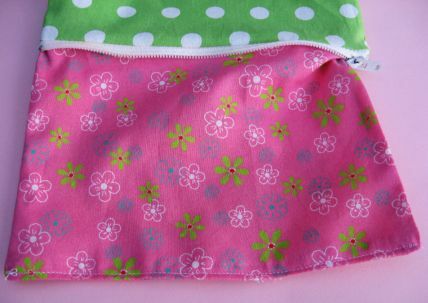 I had bought fabric to make little zippered waterproof bags for swim ware and my daughters diaper bag, but I have never sewn in a zipper so the fabric has been just sitting there. Now I know how! Thanks! Love your fabrics. so cute, & super easy. to think zipper always intimidate me. i think now i might actually have the confidence to try something like this! i've done basic zippers before, but never something with a "lining"! thank you for that, I look forward to making a few - and you know I am not religious but was so very touched at the little details that you put into that. What a beautiful gesture to sew inside and the extra touch of making it into a gift bag - that girl is going to feel extra special, and you will have certainly left a wonderful life impression on her. oooh.. I can't wait to make one of these! Mind if I post a picture and link to my site? Cute and super duper easy! I love this idea and it can have so many applicaitons. Using iron on vinyl is brilliant too. I don't remember seeing that so I'll have to look for some.